This post is fairly long, and I don’t want to bury the lede, so here it is: I’ve tracked down and digitized over 2,000 pages of copyright records from before 1870 that had generally been assumed lost. The whole story follows, but to jump to the records, they are here (part of the GW Law Library Website). Since I started this blog in the fall, I’ve occasionally alluded to a number of projects I’ve been working on regarding the pre-1870 copyright records, most notably in my post where I provided links to the transcriptions of a small part of those records. As the 2015-2016 Abraham L. Kaminstein Scholar in Residence at the US Copyright Office, my efforts were focused on a descriptive and quantitative study of the Office’s records under the Pre-1976 Act, so as to complement Robert Brauneis & Dotan Oliar’s work on the records under the current Act. 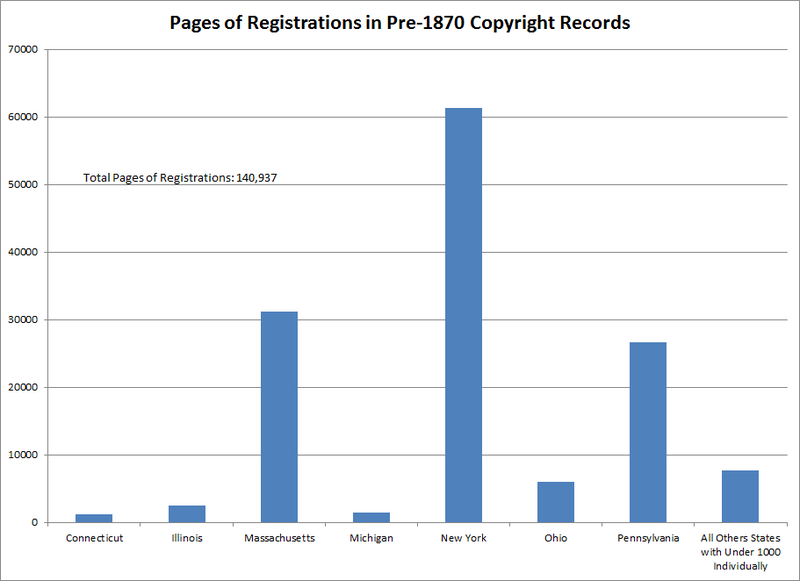 Part of that effort has resulted in a study of copyright registrations from 1870-1977, on which I’ve collaborated with Saurabh Vishnubhakat to present at a number of conferences, and which we are currently in the process of writing up into law review format. However, while doing that project, I became curious about the oldest records, those from before Copyright was centralized at the Library of Congress in 1870. Until that point copyright registrations had been made (and the records kept) at the individual Federal District Courts. In 1870 those records were transmitted to the Library of Congress, but it’s been fairly well-known that a substantial number of records never made it to the Library, and these records have generally been assumed lost. Looking at Roberts’s Checklist and these statistics, two things become clear – for New York, Philadelphia, and Boston, whose District Courts together handled 85% of copyright activity before 1870, the Library of Congress has a complete or essentially complete set of the records. However, for many jurisdictions with a comparatively small volume of copyright activity, records may only exist for the years immediately before 1870, if it at all. This seemed strange to me, thinking that so many Federal Court records had gone missing, and I began digging into the question. The actual registrations – Congress provided a specific form for the registration in the 1790 and 1831 Acts, and the Clerk of the Court would either write it out or have application blanks printed where the applicant would fill in the title and other details (all the lost records were handwritten, as only the jurisdictions with a large volume of copyrights bothered to have blanks printed up). These were generally kept in a record book, meaning that there’s likely no missing records from the period covered by a record book. Title pages – Part of the procedure for registration was the deposit of a title page with the District Court, on which the Clerk would typically make a notation about the registration. These mostly go in-hand with the registration record, but in a few cases (like the New Hampshire records for 1821-1842 included in this project) they comprise the only record. Assignment records – As now, the Courts would record assignments of copyright and keep records of those assignments. Indices – As the name implies, these are indexes maintained by Courts to assist in locating the copyright registrations they’d made. Account books – the District of Massachusetts and likely others kept records of the funds paid for copyright registrations, and those records are included in this project. One breakthrough was finding the research G. Thomas Tanselle had done on the copyright records in the 1960s, which led to his study Copyright Records and the Bibliographer. In that study Tanselle identified many records which had not found their way to the Library of Congress, and listed them in Appendix B to that work. I was able to find all the records Tanselle listed except for the Ohio records for 1829-1842, which have continued to elude me (see below for more on still-missing records). The work of other bibliographers, including Joseph J. Felcone and Roger E. Stoddard was also extremely helpful. In addition, using the online National Archives Catalog, older printed sources, and systematic inquiries to the staff at each regional division of the National Archives, I was able to locate copyright records which had not made it to the Library of Congress from seventeen states as well as the District of Columbia. At that point, I began to strategize how to get scans of these records, considering that I had no real budget for this project. Colleagues at law schools local to various National Archives locations were able to connect me with interested law students (who had a camera), and in particular Valerie Snow, Zachary Swartz, and Preston Morgan, who assisted by digitizing materials in Waltham, Atlanta, and Fort Worth, respectively. A number of colleagues including Brian Frye also assisted with getting scans of these records. I am also indebted to the staffs at various regional locations of the National Archives, including those locations, Philadelphia (especially Gail Farr), Seattle, Kansas City, and more. Thanks are also due to the members of the faculty and law library staff at the George Washington University Law School. Finally, this project owes much to my colleagues from my time at the Copyright Office. The staff at the Burns Law Library at the George Washington university, especially Ken Rodriguez, were instrumental in putting together a guide to these records that will be available to all. The guide to the lost records is now online here, with links to scanned versions of these records. Let me know about cool finds, or any other cool uses you find for these records. My ultimate hope is that the Rare Book Room of the Library of Congress will digitize their holdings of pre-1870 copyright records (which I would guesstimate as being 300,000 pages), and when combined with this project, will represent an essentially complete record of copyright (and thus literary, musical, etc) activity in America in its earliest days. Special thanks to the Virginia Historical Society, for giving me permission to share my scans of copyright records they hold from 1864-1865. One set of records that is not there yet, but I hope I will be able to link to soon, is the records from South Carolina. They are held by the South Caroliniana Library at the University of South Carolina, and I’m informed they plan to digitize them in the near future. Also of note, the records of the Confederate Secretary of State contain information on copyrights from the states that seceded during the Civil War, and have been put online by the Library of Congress. District of Columbia – No records exist from before 1845 (the State Dept. records indicate records from 1814-1844 may have survived from there). Louisiana – Records from before 1851 are extremely spotty – seven records from 1837 and 1838 were located as part of this project, but presumably many more existed at one point. North Carolina – North Carolina was divided into a large number of Districts in this time, and this project uncovered the records from Raleigh, which presumably had the greatest volume of copyright activity in the state. Scattered records exist from other Districts, including Cape Fear and Pamplico. Ohio – The copyright record book from the US District Court for the Southern District of Ohio at Cincinnati for 1829-1842 is listed by Tanselle, but I have been unable to find it. The last mention of it was in a WPA Survey of federal records; this is the Form 58SA created by the WPA cataloging the volume. I’ve been in touch with the Court and the Chicago location of the National Archives, but neither one can find it. Virginia – No records exist from Richmond before 1863, as discussed above. A letter from 1863 indicates that the records had been destroyed in a recent fire (it’s unclear how the list of copyrights from before 1844 was created, presumably the letter was partly in error). Looking at the Guide, people may note that there are also uploads of letter books as well as what I’m referring to as “ephemeral” copyright records, both held by the Manuscript Division of the Library of Congress. I plan to blog more about those next. As I noted callings these records as “lost” is a bit misleading – or at least my wan attempt at clickbaiting. However, they have been essentially unknown, especially to the legal community, and I hope this will spur interest in a fascinating area where law and culture converged in early America.